Update #6: 3/18/18 at 5 p.m. While operationally Monday will be a regular day at FIU, life on MMC will be far from normal. As a university community we continue to grieve the victims of the pedestrian bridge accident. Southwest 8th Street will be closed indefinitely, which will present many traffic challenges. Please read the information below, be patient and kind to your fellow Panthers as we work through this difficult time. FIU is open, classes will take place as scheduled. Unless notified otherwise, events will proceed as scheduled. Southwest 8th Street is closed between 107th Avenue and 117th Avenue while crews work to clear the bridge debris. The only access points to campus are on the east and west sides. Please remember that the Fair is going on next door at Tamiami Park, although it is not open Monday or Tuesday. Expect traffic congestion. The eastbound exits from the Florida Turnpike are closed. Use Southwest 40thStreet or Northwest 12th Street exits. Allow additional time for travel and carpool whenever possible. RideFlag is a carpooling app that can help you find a ride with other Panthers who live near you. Additionally, commuters are encouraged to use the FIU mobile app for garage parking space availability. Supervisors, if you have staff and faculty members who can work from home, we encourage you to allow this temporary work arrangement in order to reduce traffic. All parking garages and lots at MMC are open, except for Lot 5, which is currently under contract with the Fair. For access to the west side of campus, we recommend using Southwest 117th Avenue and Southwest 17th Street or Southwest 11th Street entrances. For access to the east side of campus, we recommend using Southwest 107th Avenue and Southwest 16th Street. Vehicles will be able to exit the south side of campus onto Coral Way (Southwest 24th Street) through Lot 24 (small lot located east of the Riccardo Silva Stadium). 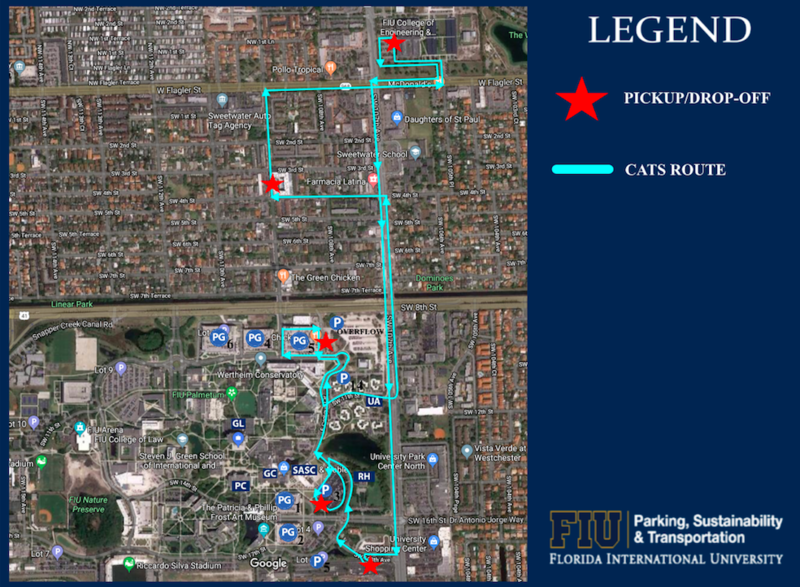 CATS shuttles will have a temporary new route. The 109th Tower and 4th Street Commons shuttles will be running 24 hours a day until further notice. Counseling resources for students are available through Counseling and Psychological Services in the Student Health Center, caps.fiu.edu, 305-348-2277. Resources for faculty and staff are available through the Office of Employee Assistance, oea.fiu.edu, 305-348-2469, or via email at oea@fiu.edu to schedule an appointment. FIU Health also is offering free mental health and counseling services for faculty, staff and the community at the Faculty Group Practice at 885 SW 109th Ave. #131, 305-348-3627. You can call ahead or walk in. Employees who have been directly impacted by this tragic incident and feel the need to take time off, please notify your immediate supervisor for approval. On Monday, March 19, at 1:47 p.m. we will have a moment of silence to remember the lives lost. Please join from wherever you are at that moment. A blood drive will take place on Tuesday, March 20, from 11:30 a.m. to 5 p.m. in Lot 33 (adjacent to the Graham Center Ballrooms). The Student Government Association has scheduled a vigil at 10 a.m. on Wednesday in the Graham Center ballrooms. Anyone who would like to leave flowers or other items in remembrance of the victims can do so after the vigil near the billboards located on Southwest 107th Avenue and 8th Street. Please note that media may be on campus. Please direct them to the Office of Media Relations, 305-348-2232, for up-to-date information. Please continue to check news.fiu.edu for updates. Thank you for your patience and understanding during this difficult time. Update #5: 3/17/18 at 8 p.m.
Our hearts break for the victims of the bridge collapse. Lives have been lost. Futures and families shattered. I have met family members and friends of the victims. My heart goes out to them. There is nothing I can say to ease their pain but we are putting our arms around them and doing everything in our power to support them. Even as we grieve, we all have an interest in getting to the bottom of what happened. This effort is being led by the National Transportation Safety Board (NTSB) in a full and comprehensive investigation. FIU is cooperating fully with this investigation and working closely with government authorities. We are also forever grateful to the first responders – including some of our own doctors, students and others who rushed to the scene – and the dozens of others who came to assist. I am particularly moved by the men and women who have worked around the clock to recover the victims. It will take time for our community to heal. As a first step, on Monday, we will have a moment of silence at 1:47 p.m. Please join us wherever you are. Update #4: 3/16/18 at 7 p.m.
We appreciate your patience as we move forward in the aftermath of the 8th Street pedestrian bridge collapse. At this time, FIU operations remain normal. However, 8th Street remains closed from 107th Avenue to 117th Avenue. As students return to class on Monday, please allow extra time for your commute so you can arrive to class or work on time. The eastbound exit from the Turnpike also is closed. Please use the Northwest 12th Street exit or the Southwest 40th Street exit. Please allow additional time for your commute to class or work. Please note that PG4, PG5 and PG6 are closed to cars but open for any scheduled classes, events or activities. Please avoid the area unless you have a class or are participating in an event. Please park in PG 1, 2, 3 or surface lots and walk to the garages. We are running shuttles between Lot 3 (in front of the SASC building) and the 4th Street Commons building in Sweetwater. Shuttles will run every 20 minutes on Sunday, March 18, from noon to 10 p.m.
We have counseling resources available for students, faculty and staff. Students who feel affected by this tragedy should reach out to Counseling and Psychological Services, 305-348-2277, or Student Clinical Services, 305-348-2401. Faculty and staff can reach out to the Office of Employee Assistance, 305-348-2469, or e-mail oea@fiu.edu to schedule an appointment. FIU Health also is offering free mental health and counseling services for faculty, staff and the community at the Faculty Group Practice at 885 SW 109th Ave. #131, 305-348-3627. You can call ahead or walk-in. The FIU Center for Children and Families is offering free individual consultations for any families with children who may have been affected by the bridge collapse. Call 305-348-0477 to schedule an appointment. Faculty and staff who have been directly impacted and feel the need to take time off, please notify your immediate supervisor. The Student Government Association (SGA) is planning a vigil to bring together the university community at 10 a.m. Wednesday, March 21, in the Graham Center Ballrooms. Anyone who would like to leave flowers or other items in remembrance of the victims, can do so after the vigil, near the billboards located on Southwest 107thAvenue and 8th Street. Update #3: 3/15/18 at 10:45 p.m.
Today is a dark day in our history. Just five days ago, we stood on SW 8th Street, united in celebration. Tonight we grieve for all the victims of the bridge collapse. The bridge that was being built was about collaboration, hope, opportunity, and determination. About strength and unity. About being good neighbors. About goodness. Not sadness. Now we are feeling immense sadness. Our hearts go out to all those affected, their families and friends. SW 8th Street, from 107th Avenue to 117th Avenue is closed until further notice. The eastbound exit from the Turnpike also is closed. Please use the NW 12th Street exit or the SW 40th Street exit. Please allow for additional time for your commute to work. Please note that PG4, PG5 and PG6 are closed to cars but open for any scheduled events or activities. Please park in PG 1, 2, 3 or surface lots and walk to the garages. Friday, March 16 from 8 a.m. to 7 p.m. The shuttle will not run on Saturday, March 17. Sunday, March 18, from 12 p.m. to 10 p.m.
We have counseling resources available for students, faculty and staff. Students who feel affected by this tragedy, should reach out to Counseling and Psychological Services. Faculty and staff can reach out to the Office of Employee Assistance, 305-348-2469, or e-mail oea@fiu.edu to schedule an appointment. We should take comfort in the fact that even on this dark day, there were glimmers of light. Our FIU doctors, nurses and medical students rushed to the scene as soon as they heard the collapse. They checked on many who were hurt and offered life-saving aid before rescue crews arrived. There will be more difficult days ahead, but even as we mourn and reflect, there is still goodness and hope in this world. Please keep everyone affected by this tragedy in your thoughts and prayers. I am heartbroken at the news of the collapse of the pedestrian bridge on 8th Street and the resulting devastation. We send our deepest condolences to the victims and their families. We are working with the appropriate agencies to assist in rescue efforts. As soon as we have further information, we will share it with you. Please keep the victims and their families in your thoughts and prayers. Update #1: 3/15/18 at 2:37 p.m.
We are shocked and saddened about the tragic events unfolding at the FIU-Sweetwater pedestrian bridge. At this time we are still involved in rescue efforts and gathering information. We are working closely with authorities and first responders on the scene. We will share updates as we have them. 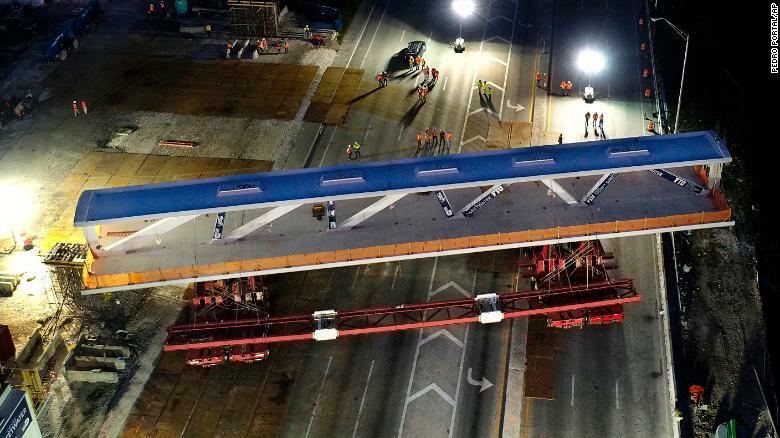 This post was originally published 3/15/18 at 2:37 p.m.
Can anyone tell us why a pedestrian bridge had to weigh 950 tons? short answer: span length and vibrations from the traffic. I do question, like you seem to be asking, why lighter materials than concrete are used. Such a tragic turn of events. It was concrete, what else was it? Michael, what do you feel is an adequate weight? Are you an engineer or architect? It weighed that much because it was constructed of steel and concrete, neither of which is a lightweight material. And it was spanning 174 feet. 950 tons is a very normal number to see in the construction world. Just like any other bridge that weigh 950 tons. Thank you for the inside. Though it does just contain “shall” comply with ‘standards’ etc. Normal engineers blah blah about what all is being taken into consideration. The specific details are not given in this document. FIU will be open tomorrow? All testing should of been done before any vehicular traffic was allowed to pass under said bridge that collapsed during stress testing…Detours should of been in place for there so called quick bridge assembly..
Dear Steve, nice thing to say. But as all buildings are being just built. There are built on side (or being moved into place being fabricated before). Such thing will seldom happen. That is why all preperations and calculations about any building is checked. Very seldom there will be a test in 1:1. On smaler scale there might. And if you look at a building like Burj Khalifa (https://en.wikipedia.org/wiki/Burj_Khalifa) 1:1 is impossible. Bet some engineers just do their job, and some downscaled models will be tested. But this was a standard – partially. When exactly did the bridge collapse? Bridge collapsed around 3pm today. $14 Million dollars for a 950 ton PEDESTRIAN bridge that collapses, seriously injuring others. In jungles all over the world and remote locations pedestrian bridges are safely constructed using bamboo and rope. Even $14 million dollars couldn’t guarantee safety in this case, just follow the $ and you will find the ones at fault. Yes, let’s use a bridge of bamboo and rope instead. That sounds MUCH safer. Quit trolling during a tragedy. It’s pathetically transparent what you’re doing. How much money have you made on these deals, Mark? You can’t keep students…just lure them in…big school, but it’s definitely inflated! Folks, Miami is as crooked as it gets. No one wants to touch this with a ten foot pole because the truths that lurk beneath the sordid lies/coverups. I’m suddenly reminded of Sudan and Gomorrah. How much money have you made on these deals, Mark? You can’t keep students…just lure them in…big school, but it’s definitely inflated! Folks, Miami is as crooked as it gets. No one wants to touch this with a ten foot pole because the truths that lurk beneath the sordid lies/coverups. I’m suddenly reminded of Sudan and Gomorrah. Heartbroken. Such a sad news and a shame for FIU community. The president should resign. Period. I am in complete shock over this unfortunate disaster. FIU is near and dear to my heart as I have been both student and staff years ago. Dr. Rosenberg is an amazing person who has the FIU community in his best interests. Any attack on individuals is in poor taste and uncalled for at this time. Very sad day. This is not attacking individuals. This is about people who lost their lives in such a senseless way under the leadership of FIU. Very sad day for all of us. Mayor Gimenez’s son Julio used to work for Munilla Construction. In this March 10th photo look at the strut bracing on the left side of the bridge compared to the right side of the bridge. May be camera angle but, it does not look like what I would expect to see. Heart broken! I spent two years studying at FIU and the school is dear to my heart. Our prayers go out to all at Florida International for you Loss. I believe the bridge itself was incomplete and shouldn’t have civilians driving under or around till the structure had at least its supporting cables connected to prevent such a tragedy that resulted earlier today. Prayers and Sympathies to the FIU and Sweetwater community during this troubled time. This is a time of compassion and sensitivity for those impacted. Why didn’t this bridge have center support in between the turning lanes ? Why did it need a cement roof? How many people approved this tragedy. How many other bridges has this company installed. I hope that the cement and Materials are seriously investigated. I’m still not clear on how a cable stayed bridge was supposed to be supported in an interim period of construction without the cable stays that are integral to structural support and stability. Clearly the truss elements were aligned for the tensile loads of the cables and not arranged how a truss bridge without cables would be positioned. Something about the construction phase of the bridge without its cable stays will hold the answers here. How much detail do we have regarding how F.I.U. went about the process of deciding to erect the pedestrian bridge? Precisely which pedestrian accommodations were entertained by the university, or were their deliberations limited exclusively to a proposed bridge? A host of geo-physical factors, such as the soils, hydrology and the underlying stratigraphy may all have played a role in the bridge’s failure. Also, there’s the extant buried-infrastructure at the site (storm and sanitary drain, water, utilities, etc.) the relocation of which would be costly. But wouldn’t those very same factors as well have bearing on the design, construction and cost of a bridge? And it seems reasonable to presume that the university, an institution with recognized expertise in bridge construction, would naturally gravitate toward building a bridge. However, pedestrian safety must always be the paramount concern in matters affecting the nexus of automobile and pedestrian traffic. As such, for anyone crossing a road on-foot or on a non-motorized conveyance, the safest accommodation would be a pedestrian tunnel. It would be instructive to ascertain the process untertaken by F.I.U. through which they arrived at their decision to construct the bridge. Further, what other accommodations did they examine? Was a pedestrian tunnel among them? If not, why?